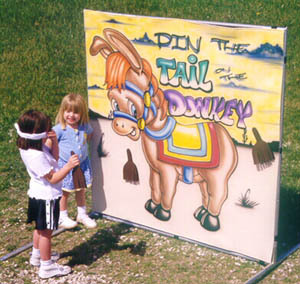 At 5' X 5', Pin the Tail on the Donkey is smaller than the traditional frame-game, making it much more convenient. It can go just about anywhere, Plus, transportation and storage is a snap. (Set up time: under 5 minutes.) Twister's Pin the Tail on the Donkey can be packaged together to create an attractive rental. Also, Pin the Tail on the Donkey can go out by itself or as an add-on item with other products.